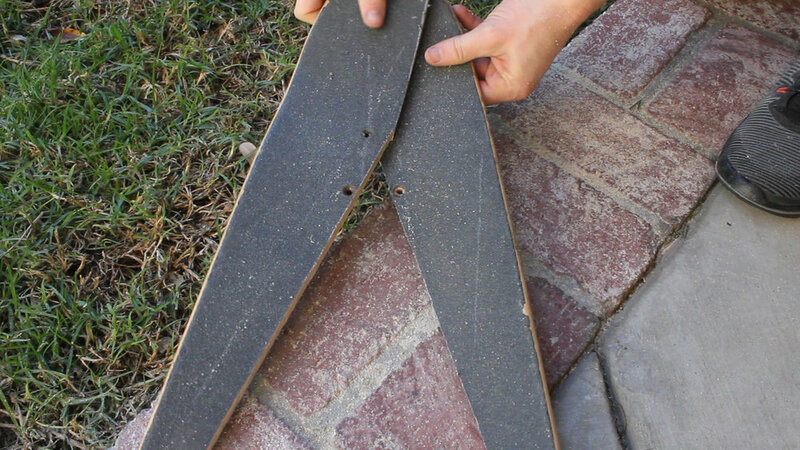 I happened to have a skate deck sitting around my apartment, and I knew that at my parents place, they had a full skate deck that no one had touched in 10 years. 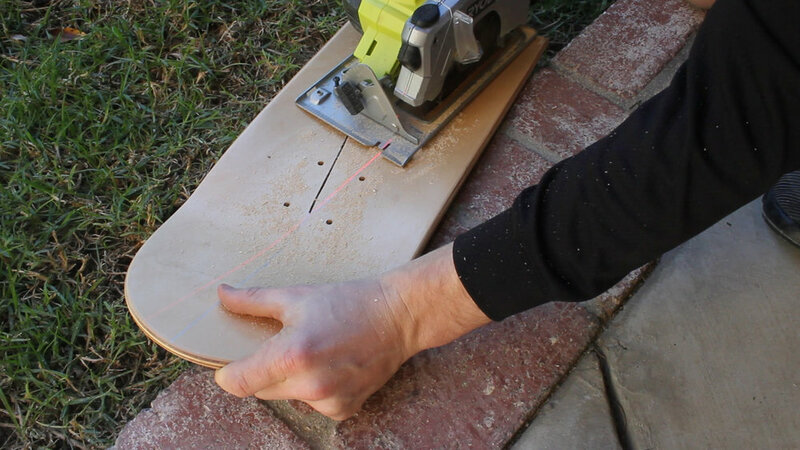 I did a bit of research and found a bunch of cool DIY skateboard projects that I knew I could tackle in half a day. My design didn't quite match up with other ones I saw - most required 3+ boards which I didn't have, but I did a bit of math and figured out what I could make. Hope you enjoy! 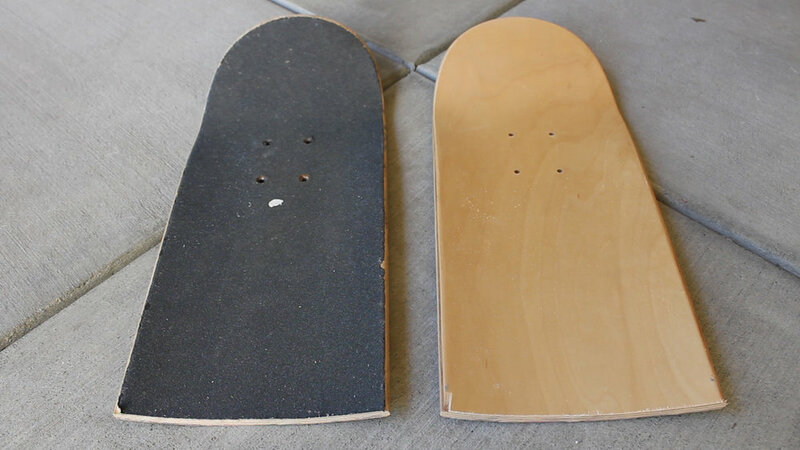 Here are my two decks - it does not matter what condition your boards are in or if they have grip tape or not - just get two boards and get excited about the project! They also can be different lengths and widths! I started by removing the trucks - you can save the hardware but you won't need it for this particular project. 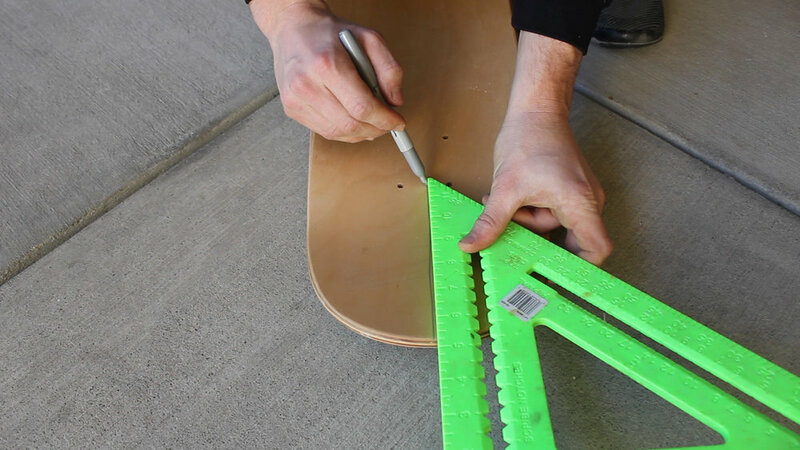 I measured and cut my two boards to 19" long. This length is totally up to you and doesn't make or break the design - feel free to cut whatever length you want - just make sure you make them equal and keep in mind that you'll want to keep a good amount left over for the seat! I'd say for a stool, stick to 17"+. I marked out how I was going to cut out my pieces. Draw a line down the middle (it can go as far down as you want - I don't even remember my length! 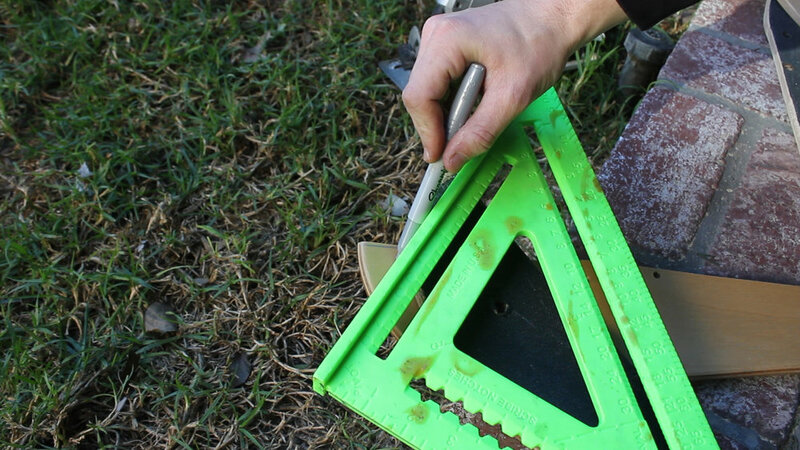 ), and then connect that center point to your two corners. 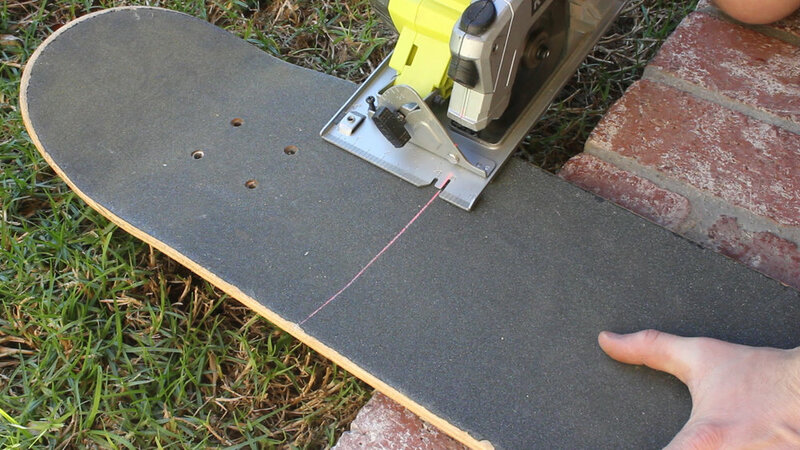 You can cut this out using any cutting tool - hand saw, jig saw, circular saw, table saw, or band saw. I used my circular saw as that was easiest. I cut my second piece the same by using the first triangle I had cut out to marked the lines. This kept them nearly identical. 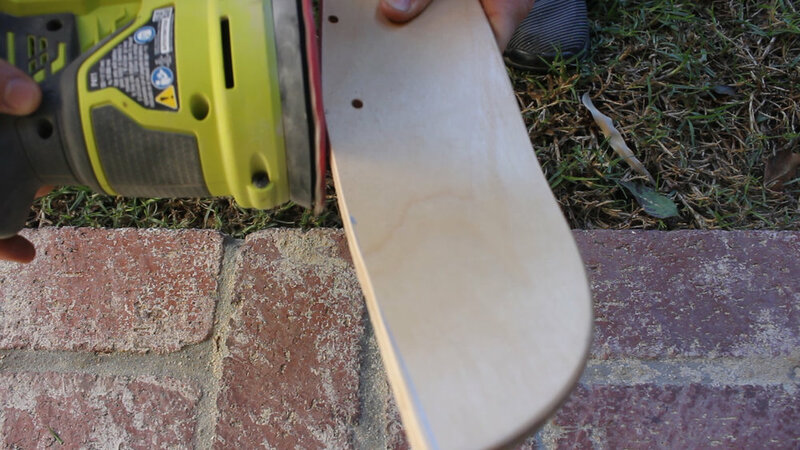 Next, I sanded down the cut edges with 60 grit sand paper using my orbital sander. Feel free to sand these down as fine as you want. I followed up the orbital sanding with a hand sanding block at 120 grit (not pictured). Next - remove the wheels from one of the trucks - you can keep them and use them for a future project. Keep the hardware close - you'll need it later! I marked a point 4" down and in the center of my legs (this was based on how low I knew my truck wheel points would be) and used my 3/8" drill bit to cut our holes in all four pieces. 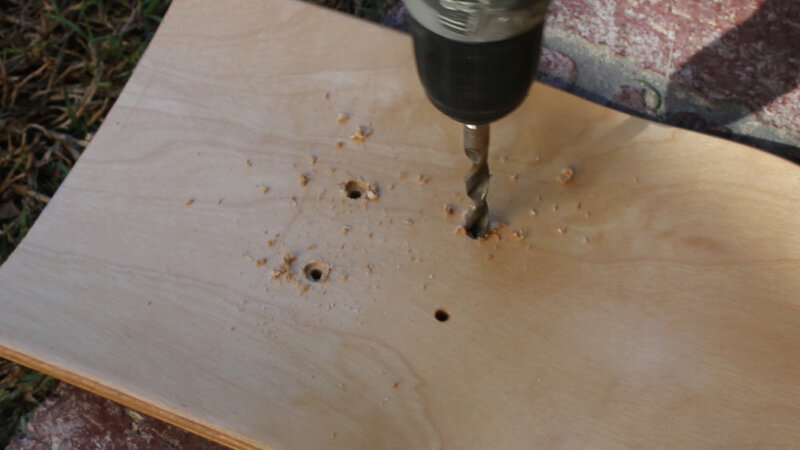 Using the same 3/8" drill bit to counter sink the screws so they'd sit flush with the seat board. The first picture in this stack shows the additional four screws I'm using to hold the long screws tight against the board. The second picture shows me using a second set of four screws to secure the trucks to the long screws. This thing is held together purely with pressure - no glue or any other fasteners. 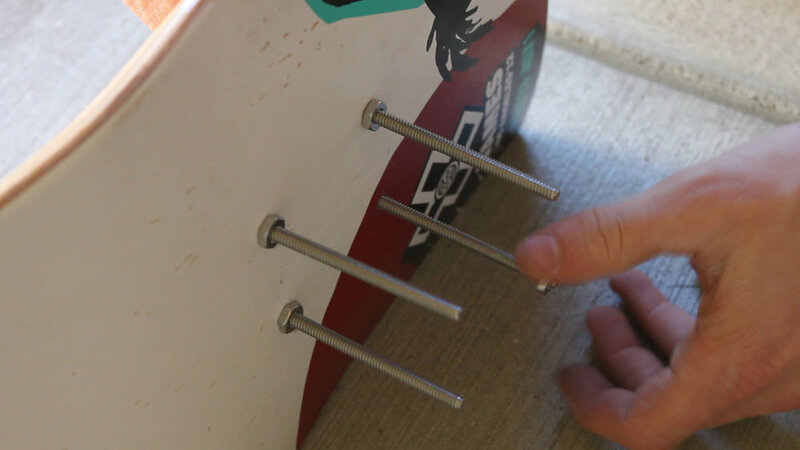 This happens by simultaneously pushing the trucks up close to the seat using the four small screws while also having the two truck bolts stick outward through the legs. Everything becomes tightly secured once the legs are forced against the bottom of the seat. Hard to explain, but you'll feel it come together when you build it! As mentioned above, last minute, I used a single screw on each leg to hold them together so the legs wouldn't slide when pressured against the seat. I didn't have to drill a hole for this - I just use the existing hole from the truck screws. 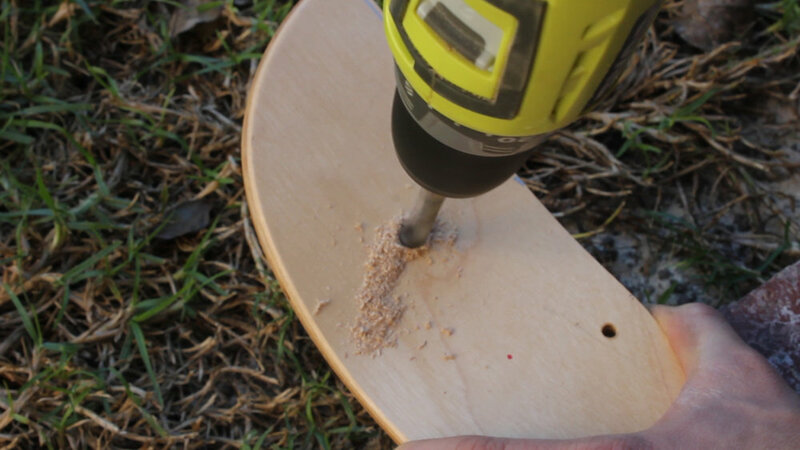 I then use my circular saw to mark and flatten out the tops of the legs so that they would sit more flush against the bottom of the seat. 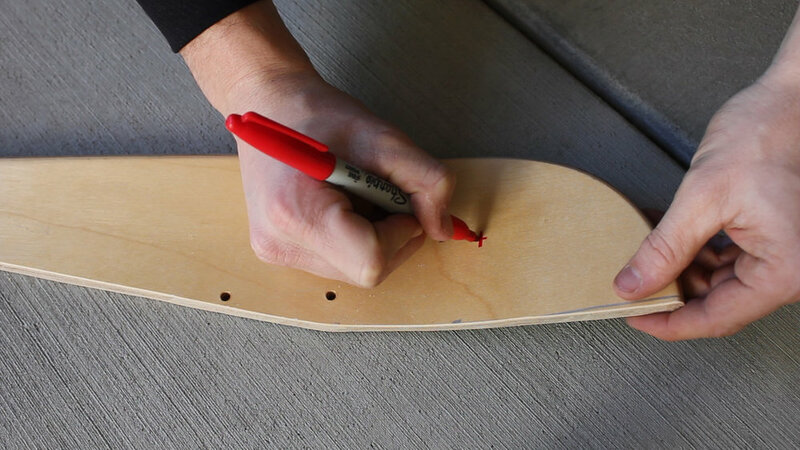 Not pictured here is me using my belt sander with 60 grit paper to flatten and shape things further to make it more snug - I recommend doing this as well as although your cuts will be straight, it helps to angle the edges slightly to fit the convex nature of the skateboard. Time for final assembly. I attached the two legs to the trucks using the same hardware washers and nuts that held the wheels on. I then tightened the four screws on the truck (third picture) so that everything was forced together through pressure. 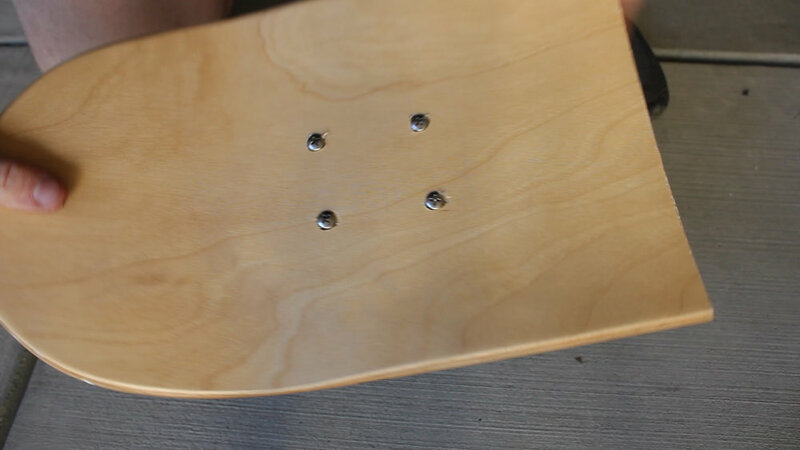 The tops of the legs will be forced against the bottom of the seat but retain their shape because of the additional screw added earlier. 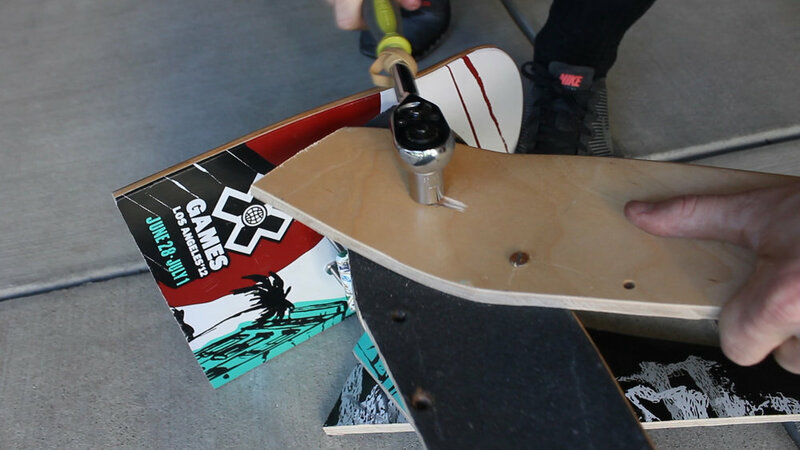 When the legs push up to the underside of the seat, it pushes the truck up against the four screws you're tightening, making everything quite sturdy. My one reco is to tighten all four screws initially, and then tighten them all incrementally with a wrench to that everything tightens up evenly. 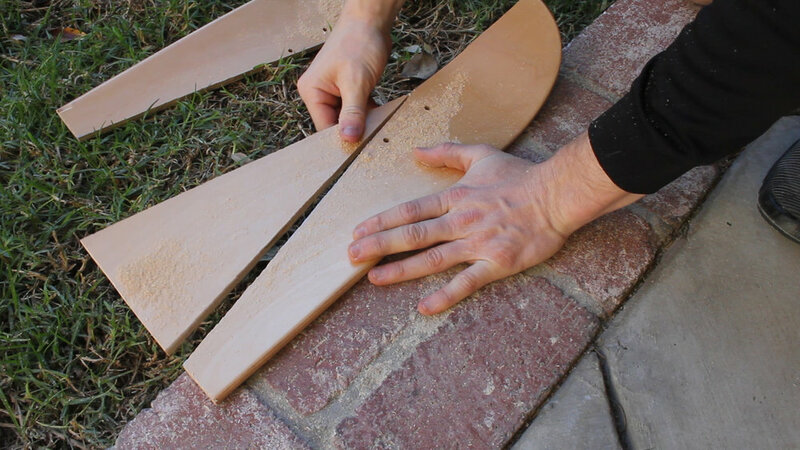 Lastly, in order to have the seat sit parallel to the ground, I cut off a bit of length (not going to give a measurement here as it was unique to my size and leg length) on two of the legs. Just use your best judgement - start with less and cut off more if needed. Then I tested it out! I'm not the biggest person, but at 160 pounds, this thing was rock solid. Few close up final pics! I love this thing. I love it even more that people sell them on Etsy for $400+ and I was able to make one for $5. If you have any questions - feel free to reach out to me via the "Get in Touch" section and I'd be happy to answer them. Thanks for reading! I would be so grateful if you could please subscribe to my new Youtube Channel for future projects. I put out videos every other week.